on the Cavaliers in a 1975 hockey game. With the NHL Finals getting underway today between the Chicago Blackhawks and the Boston Bruins, hockey's most coveted prize, the Stanley Cup, will soon be awarded. Perhaps little known to fans around the world, the drum corps activity, normally associated with its summer series of competitive events, once had its own Stanley Cup Finals that featured a small league of drum corps-affiliated hockey teams. Well, actually, the winner of the drum corps championship received Stanley's Cup, a trophy featuring a gold-painted athletic supporter created by a member of the Madison Scouts. Fortunately, perhaps, no known photograph exists of this trophy, so it shall remain lost to the annals of history. In 1975, members of the Cavaliers and Madison Scouts met at the Ballard Ice Arena in Niles, Ill., a neighboring town to the Cavaliers' hometown of Park Ridge. They met to play what was thought at the time to be a one-time game of camaraderie between the two corps. Almost four decades later, it seems that very few people involved with this game have any recollection whatsoever about the event … especially regarding the score. However, I was in attendance, and I can attest that from what I remember of the results, the members of Madison Scouts apparently played hockey on a somewhat regular basis, while some of the members of the Cavaliers' team possibly weren't aware that hockey was played on skates. (One member admitted to me that he had never before played hockey until the Niles game) After that first game, another one was held in Madison. A couple members of the Cavaliers team recall only that the score was again rather lopsided. But that second game led to one of the more interesting events in DCI's history. Jeff Knupp, one of the Madison Scouts' 1975 color guard instructors, was coach of the corps' hockey team. Bill Howard, executive director of the corps at the time, asked him at a January rehearsal to consider forming a hockey team in order to accept the invitation extended by the Cavaliers to do so. Like Jeff, some of the corps members played organized hockey several days a week at various levels of competition, and others who just enjoyed skating at many of Madison's outdoor rinks. 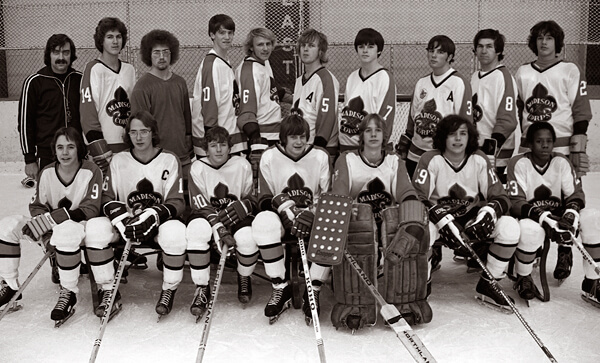 A Motley Crew: Team photo of the 1975 Madison Scouts hockey team. A team was soon organized and members chipped in to buy ice time for a few practices. In early February, they drove to Chicagoland for the first game, and were surprised to find that the Cavaliers' team had actual uniforms. With a pretty decent-sized crowd in attendance, Knupp thought, "I wonder what we've gotten ourselves into," adding, "The Scouts won a close game, and then we stayed with individual Cavalier families for the rest of the night. I remember spending the night at the home of the Gengler family, sitting in their kitchen and talking drum corps for hours. Somewhere in the conversation we agreed to host the Cavaliers for a game in Madison in early March." For that game, the Scouts had uniforms modeled after those worn by the Philadelphia Flyers. (Philadelphia would be good to the corps: It's the city where Madison would win its first DCI World Championship title that August.) More than two hundred tickets were sold, which paid for the rental of the Hartmeyer Ice Arena and allowed for Madison's Capitolaires All-Girl Corps to play a broomball game before the main event. (Broomball is sort of like hockey, but is played with a ball, special sticks that kind of look like car ice scrapers and rubber-soled shoes on ice that is treated for additional traction.) The evening's referees were members of the University of Wisconsin hockey team. (One of them, Brian Engblom, became a television analyst for NBC Sports after winning three Stanley Cups with the Montreal Canadiens.) After the Scouts won that game, plans were immediately offered for a corps tournament to be held in Madison the following year, coordinated by Scouts rifle line member Alex Saloutos. 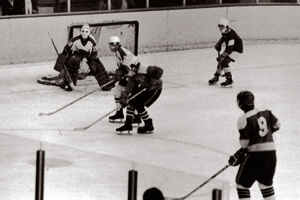 In April of 1976, hockey teams representing the Madison Scouts, Cavaliers, Finleyville Royal Crusaders and 27th Lancers met in Madison for the 1976 Madison Scouts Invitational Hockey Tournament. Preliminary rounds were held on Saturday afternoon between the Scouts and Royal Crusaders and Cavaliers and 27th. Flag squads from each corps, in the uniforms of their corps, gathered at center ice for the playing of "The Star-Spangled Banner." On Sunday afternoon, the championship game was played between the Madison Scouts and 27th Lancers, with more than 400 paying customers in attendance, along with a local television news crew. According to 27th Lancers' hockey team member Terry Keenan, the Scouts turned the weekend into "an awesome event, with coolers in each locker room refreshed after each period, and plenty of oranges and bottled water for the players." The 27th team was coached by two staff members, percussion instructor Jack DeRosa and brass instructor Alan Cash. According to Keenan, "They pushed us harder on the ice than we ever were on drum corps tour." Keenan remembers that this may have been the catalyst of a large number of assessed penalty minutes, but it also resulted in the team beating Madison 8 to 6. The corps' team was presented the trophy by DCI Executive Director Don Pesceone. Of special interest, according to Keenan, is something that started that final game. The members of Royal Crusaders' team, sitting in the stands, started to cheer on their fellow easterners with a chant of "East, East, East!" The chant showed up on the field that summer and has enjoyed a regular presence at DCI events ever since. After the tournament, Scouts' hockey team members agreed the hockey program was taking too much time away from preparing the corps for competition, and so the event was dropped. With a sense of nostalgia undimmed by the passing decades, Keenan adds, "It would be nice if drum corps could present more events of this type during the off-seasons."